Magnesium® SP is one of the lightest, full-powered upright vacuum cleaner in America. 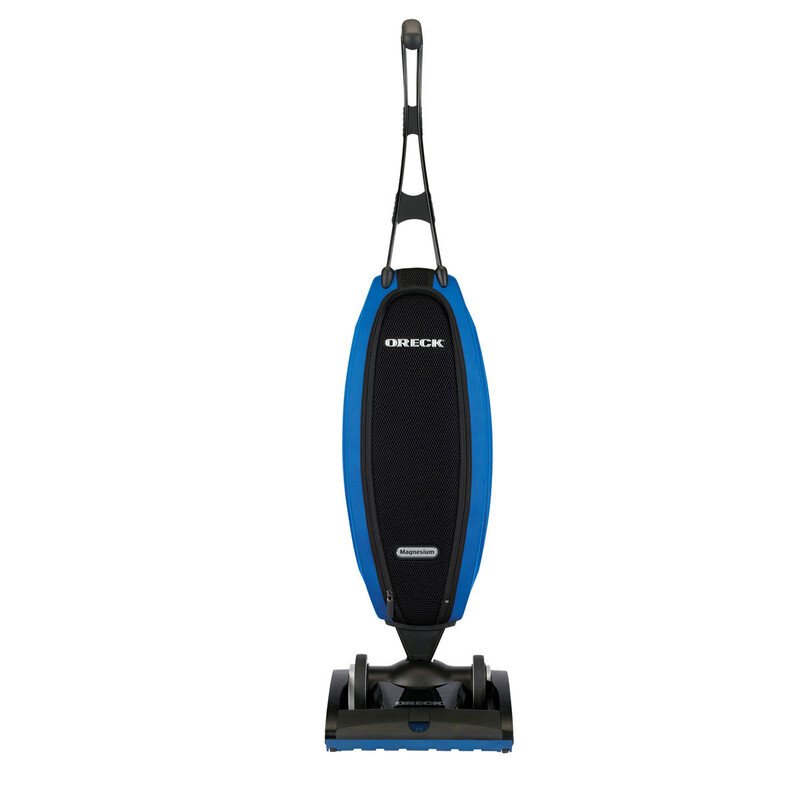 With its extremely strong, durable magnesium frame, the Magnesium SP packs all the power you expect from an Oreck vacuum cleaner — so much power it feels like it’s self-propelled on most surfaces. The two speed Quickswitch® on the back of the vacuum enables you to move smoothly across all floor types using appropriate power levels: high for carpets and low for hardwoods and tile. It’s even gentle enough for fine Oriental and Persian rugs on low speed. Additionally, the large high-performance rear wheels with cylindrical wheel bearings give the Magnesium SP maneuverability, making it easy to push through high-pile carpet. Best of all, it lies virtually flat for easy cleaning under furniture. The direct suction and rollerbrush rotating at 7,000 revolutions per minute draw dirt right into the bag. The brush grooms the nap as it cleans. The Saniseal® system automatically seals shut, locking the dirt in the disposable filter bag. Changing bags is effortless. Magnesium SP Vacuum Cleaner lies virtually flat, has a wide cleaning path and a 30 ft. cord, making it easy to cover a lot of ground, quickly get in and out of tight spots and get up and down stairs. Magnesium SP Vacuum Cleaner uses a HEPA inner bag. As air passes through the HEPA inner bag, it captures at least 99.97% of particles as small as .3 microns from that air, such as pollen, dust, smoke, animal dander and mold spores. The new ‘Easy Snap’ cord clip is the smart way to keep the cord where you need it … not where you don’t. The Oreck Magnesium SP Vacuum Cleaner has received the Gold Seal of Approval from the Carpet and Rug Institute, the leading U.S. carpet authority, which certifies that it meets the highest performance standards. Need to change the bag on your upright vacuum cleaner? See easy, step-by-step instructions with photos here. Did you know that you can change the belt on your upright vacuum cleaner yourself? We’ll walk you through it, with photos and easy-to-follow instructions right here! As seen on The View! Named New Product of the Year by the Vacuum Dealers Trade Association.